DAXKUN has no current links. Things about me... I am completely weird, I seem almost normal at certain times and then every now and then I notice people will look at me like I'm some kind of alien. It's all good because I know that I am me. I am a gamer so a lot of my hobbies involve me chilling around with friends playing video games, or occasionally going out for a few drinks. I am very much the Jack of all Trades and enjoy doing just about anything. That aside I'm joining this site as kind of a goof. 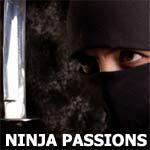 Though I do enjoy the thought and belief of the ninja. Also one is born with the potential physique of a ninja. Whether he chooses to become one or not is up to the ninja in training.